Anti-racist campaigners have demanded the Conservative Party chairman explain why he claimed there were no outstanding Islamophobia complaints. 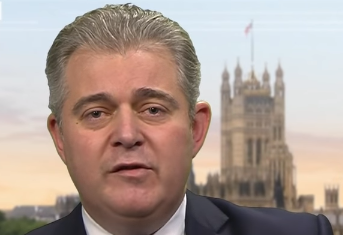 Hope not Hate have written to Brandon Lewis asking for an explanation, saying that his claim was “untrue”. I am writing to ask for clarification about statements you made to HOPE not hate last year, when you insisted in a tweet to us that: “We deal with complaints, none outstanding,” in respect of incidents of Islamophobia by members of the Conservative Party. You made this statement in response to a campaign we had been running to ask for action to be taken against Boris Johnson for his mockery of Muslim women. But your statement was all-encompassing. We took your statement to mean that there were no complaints of Islamophobia outstanding – but we now know that this is not true. 3) A complaint to you about a member in the northeast who had talked on social media about “aggressive muzzies” who he claimed were praying in public to “provoke a reaction”, as reported by HuffPost on 1 March. All of the complaints were made to you or your staff before you made your “none outstanding” claim to us, and none were, according to media reports, resolved by the time you made your comment to HOPE not hate. Given the seriousness of the problem that the Conservative Party is facing with incidents of Islamophobia by its members, and widespread concern about the behaviour of Boris Johnson MP and Zac Goldsmith MP, it is essential that you clear up exactly why you told HOPE not hate that there were no outstanding complaints when clearly there were. Were you trying to mislead us, and via the statement, members of the public? Or are your systems and processes so broken that you did not know your statement was untrue when you made it? Either way, it appears clear that the time for a proper, independent inquiry into the Conservative Party”s problems with Islamophobia is now. You can show that you take this issue seriously and call that inquiry immediately. Given the situation the party appears to be facing, I also want to extend HOPE not hate’s support to your team to help improve processes to identify Islamophobia and to challenge it more systematically throughout the party. If you would like to take up this offer, please be in touch – our team is ready to meet yours at your earliest convenience. The Muslim Council of Britain (MCB), former Tory Party chair Sayeeda Warsi and others have called for an inquiry into Islamophobia in the Tory Party. The MCB’s Miqdaad Versi told Left Foot Forward recently that Tory MPs are getting away with Islamophobia while junior members are left hung out to dry. It beggars believe what this smart-suited barrow boy is saying (safe in the knowledge the press will not scream at him) when the most senior Tory Muslim was complaining about inaction last week but Islamophobia is not on the agenda of the Tory Press, although that may change for a while in the light of the Christchurch massacre. It confuses the agenda of characterising the Labour Party as anti-Semitic although I as a member for 50 years have never seen or heard of anti-Semitic actions or words and I suspect my experience is the same as the vast majority of Party members. In either case the evidence must be made public. Both Jewish and Muslim leaders are subject to much anonymous abuse from sections of the public.